Monuments et Vues des Environs de Paris. 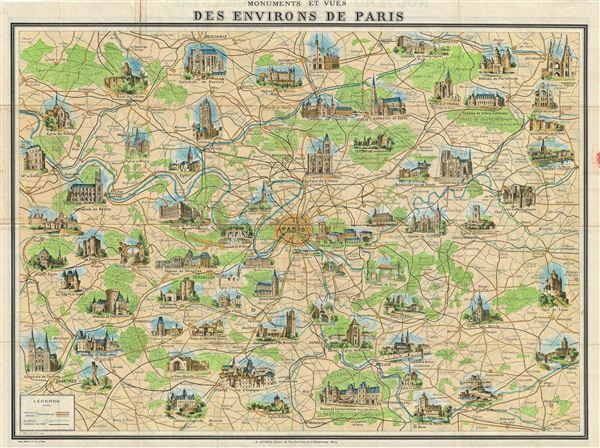 An attractive and decorative 1948 map of the environs of Paris by A. Leconte. Centered on Paris, the map extends roughly 50 miles in all directions, cover from Chartes to Soissons and from Fleury sur Andelle to Sergines. Roads, rail lines, rivers, bridges, and forests are indicated throughout. Historical sites and monuments are rendered via vignettes, making this map exceptionally decorative. Leconte first issued this map in 1928. It proved extremely popular and went through many updates and revisions until about 1954. It was originally drawn by F. del Menetrier. Good. Backed with archival tissue for stability. Some wear on original fold lines. Minor damage on verso from application of old cellophane tape. Printed map of central Paris on verso.